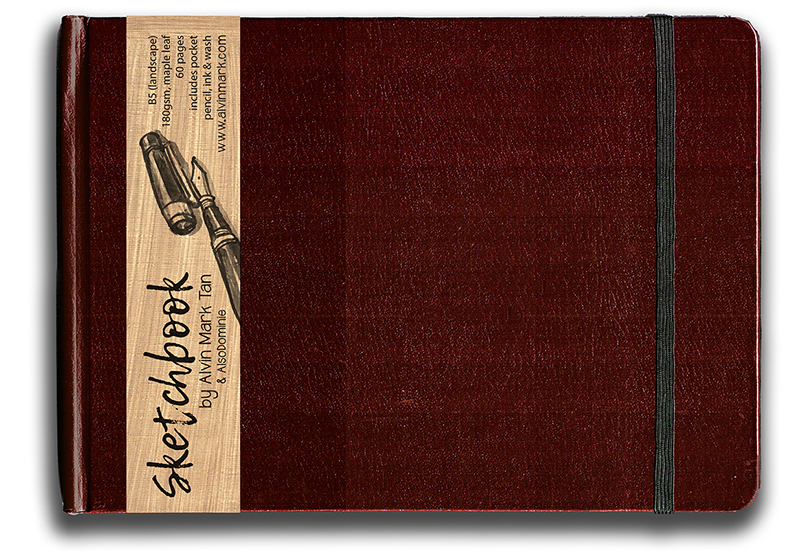 This is my first shot at designing sketchbooks for fellow artists to use. Being a full time urban sketcher myself, I know at first hand what sketching conditions are like on location. This is my creation together with AlsoDominie, to produce a B6 landscape (17.6cm x 25.0cm) format size sketchbook. Here's the rational behind the choice of materials used. 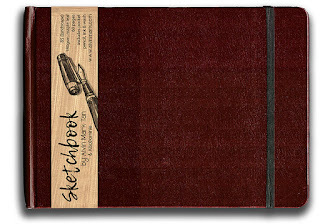 There are plenty of A4 and A6 (hardback) sketchbooks out there, but only a handful of A5 and B6 hardbacks. It makes a difference when you are out there sketching on location for about 30-45 mins, standing up and holding your sketchbook. What may seem like a 400gm A4 can miraculously turn into a 10kg dumbbell after 15-20 mins of sketching. I am a lover of landscape format sketchbooks. They allow for those long panoramas! but in a much shorter span of time. AlsoDominie and I had to come to a compromise. I was looking at heavy weight 300gsm Fabriano, but given the budget for the project, we settled for 180gsm Maple Leaf. It never hurts to have an extra pocket especially when you are travelling. It's a good place to store maps and tickets for quick references. 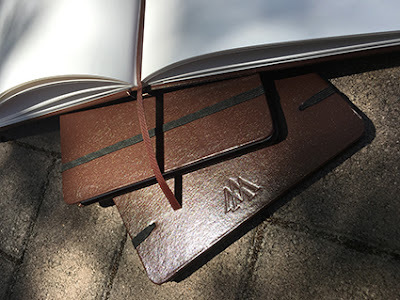 I use the hardback as a table during those moments when space is tight or if I am standing up for a sketch. It can also balance my watercolour kit and water container at the same time! The Alvin Mark sketchbook is a collaboration with AlsoDominie Print and made its public appearance at Inkling: Vol 2 on 4 August 2017. Here a run through of my Sketchbook Volume 1 using a time-lapse format. Imagine a whole entire country measured by the collective happiness (Gross National Happiness) of its people, and not by its GNP (Gross National Product). Meaning its GNH is more important than its GNP. Not only is this a real place, the better news is that many other countries are looking into developing this philosophy too. The term was coined by the country's 4th king, Jigme Singye Wangchuck, in the 1970s. I was blessed to be able to spend sometime there, learning and observing the people and culture of Bhutan. Thank you, Druk Asia, for the opportunity to experience this. dress for women in Bhutan, became the point of interest for me. that when the plane landed, I immediately threw in one for my sketchbook. Welcomed by my guide and driver upon arrival, our first stop for lunch was at Thimpu, the capital. at the Royal Textile Academy. My hotel in Thimpu is right within walking distance of the Norzin Lam, its main street. I headed there immediately after dinner for a sketching spree. The tiny commercial shops that line this street is worth visiting. Still puzzled as to how they can squeeze so many things into that one little space? Finally got into a Gho, the traditional dress for men in Bhutan. It's actually pretty comfortable. You should try one when you are there. crisp morning air with the mountain ranges as a backdrop was definitely a plus for me. The chief abbot is in town and chanting mantras for a 3-month long event being held at Buddha Point. Meeting and interacting with locals is the main highlight of my travels around the world. Here in Bhutan, it is no different. A good portion of my time is spent talking and sharing my art with the locals. And in return, I learn heaps about their way of life. while I catch a moment to enjoy a cup of local butter tea. (where the suspension bridge is), I meet more students on their way home from school. the walk each way from home to school takes about 80 minutes. Waiting for the oldest monastery Changangkha Lhakhang, to dry. more locals here are becoming vegetarians. little clip I made to show how paper is made in Bhutan. At the halfway mark while scaling up Tiger's Nest. Here are highlights of my sketching adventure on You Tube. Thank you to my super informative guide Kuenzang, my cool driver, Jamyang. Thank you Druk Asia for creating this memorable experience for me. And thank you all of you for tuning in with me on this fantastic journey back to the past. is a traditional oil painter residing in Singapore. He also illustrates in ink and watercolour. 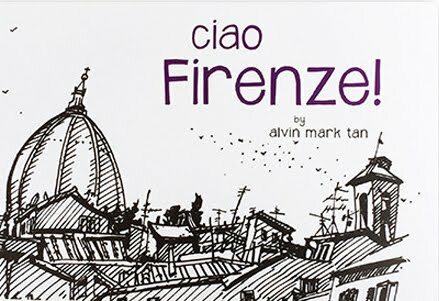 Alvin began his graphic design career with the Ministry of Defence in Singapore. design and documentary-making. He also has an Animation diploma, with a focus in concept art. After walking the Camino de Santiago in 2012, Alvin made a bold decision to sell and leave everything to study what he was always called to do - traditional oil painting. He graduated from Angel Academy of Art in Florence, Italy, where he studied Natural Realism under Maestro Michael John Angel for three years. Apart from doing commissioned art works ranging from still lifes to portraits to ink sketches to wall murals, Alvin loves drawing directly from nature. So he is often outdoors doing plein air paintings, on the streets urban-sketching, or commute sketching in his travels. His goal by being a full-time artist, is to encourage people to live out their vocations in life. I spent a fruitful 2 weeks in lovely Ireland in a festival called Art in the Open which takes place in Ireland every summer. In its 10th year running, the 8 day programme took us to several spectacular sights and locations in south east of Ireland, specifically in the county of Wexford. I made many, many new friends, and also met friends I haven't seen in over a year! What a joy it was to be there, reminding me that I am not alone in my painting quest. In the words of fellow painter Louise Treacy: "Aren’t we really lucky to be out here in nature looking at this? Painting and representing it in our little happy place?" I was invited to give a workshop on Urban Sketching at the local library, attended by 70 over people. It was the first of its kind and many were grateful that the whole sketching thing finally took off. My hopes that the sketching spirit keeps going for the next 11 months - until the next Art in the Open. Being the only South East Asian in the festival has its perks. I can be spotted a mile away. After being interviewed live on South East Radio's Morning Mix with Alan Corcoran, the locals who saw me painting on the streets, would walk up to me and say, "Aren't you the guy from Singapore?" or "I heard you over the radio, welcome to Ireland!" This is just scratching the surface of how hospitable the locals can be. Thank you, Wexford! With Bill Kelly and his daughter. Thank you for stopping by! This is Sadhbh ('Sive') - the artist who won the sketching contest. Watch out for her, Wexford! to fly a drone within minutes. I spent a lot of time documenting and putting together the sights and sounds of the entire event. Here are the videos links for Art in the Open 2017. Enjoy and share! I started drawing again because of an animation programme I took in 2009. Many might find that peculiar because 3D softwares like Maya was the main staple. During the first semester, drawing (with pencils) took up most of the day’s schedule - from short gestural poses to sketching simple still life set ups. 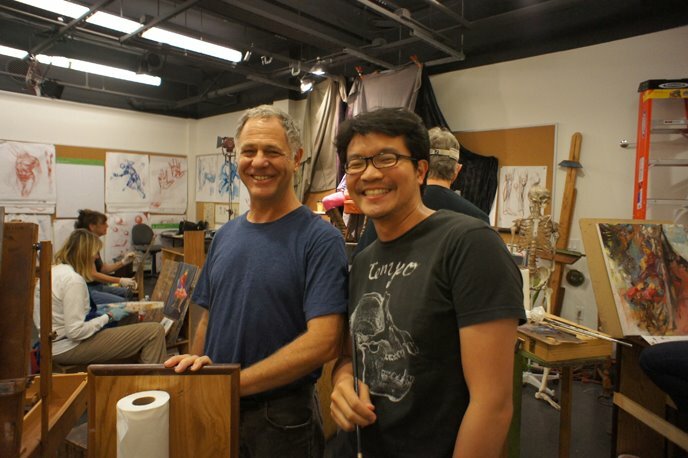 The classically trained animation-based instructor, Philip Garcia, took us outside the classroom to draw too, like the zoo, botanic gardens, bird park and Gunther von Hagens' BODY WORLDS exhibition. That eye-opening semester began to change the way I thought about art. The last time I picked up a pencil before the animation programme was probably during the first year of design college. After which, I used the mouse to draw logos, design advertising campaigns and churn out illustrative graphics. 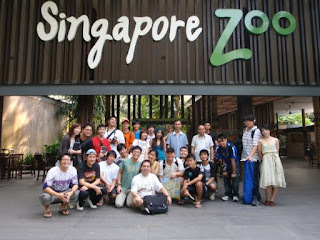 Fast forward to 2011 – the time after the animation programme. I headed to the city of Los Angeles for a short 3-month stint in concept design with some of my animation classmates. Most of the classes I signed up for were drawing classes at the Animation Guild in Burbank. It was there that I was able to study under two great living instructors of the human figure - Glenn Vilppu (bottom left) and Karl Gnass. Although I didn’t pursue the field of animation after the three months in LA, my appreciation for traditional arts deepened. 2012 was the year I decided to move away from a digital artist to become a traditional one. Some of the things I did to achieve this goal were to 1) request for more illustrative works, 2) buy an annual zoo pass and faithfully headed there once a week and 3) sign up for portrait studies and figure drawing at the local community clubs. 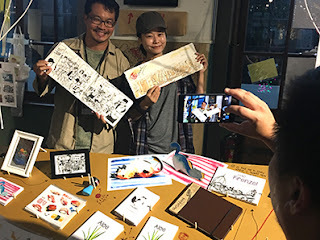 I heard about Urban Sketchers Singapore (USKSG) who meet to sketch every month end and decided to join them. Finally, I was able to connect with like-minded people with a passion for drawing. I learned heaps about inks, watercolours and sketchbooks from the various art groups that I joined. The more I sketched, the more I craved for it. 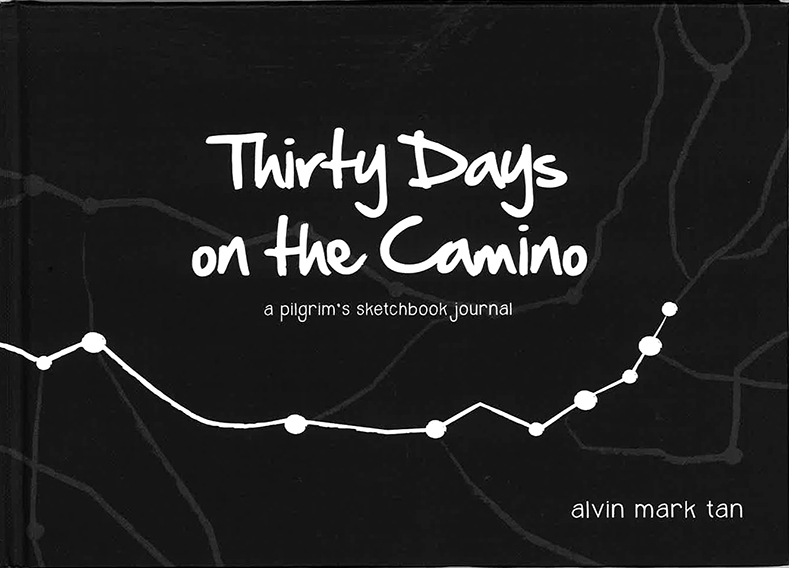 By the summer of 2012, I decided it was time to attempt a sketching journey on the Camino de Santiago and make a book out of it. After completing 800km and using up four sketchbooks, a revelation hit me - life is too short to be doing something else. 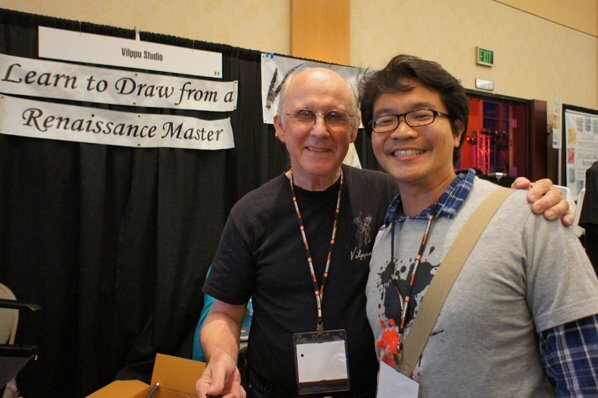 After publishing my first sketchbook in Dec 2012, I made plans to study art… from scratch. And by April 2013, I began my basic training at the Angel Academy in Florence under Maestro John Michael Angel. It was only a year after (spring of 2014), did I begin to learn the methods of oil painting like the traditional old masters. Initially I thought that I would be weaning off my ink and watercolour sketching at some point in order to focus on oil painting. But over time, I realized how the doodles that I do on the streets complemented my oil painting, and vice-versa. For example, the amount of ink sketching I do would directly translate to quicker and more accurate drawings in the painting stage. Likewise, the oil paintings I make sharpen the way I see values and depth, and that would allow me to easily apply those concepts while I’m sketching or watercolouring. Using inks give me the needed breathing space away from oil paints. This time allows me to absorb and process what I just did, instead of moving immediately into the next project. It’s almost like giving the food I eat some time to be digested before rushing to my next meal. I let myself stay loose when doodling in my sketchbook. When I do my oil paintings, I tend to be a little more precise and meticulous. This sketchbook play time helps me stay creative (without any boundaries) and maintains that balance I need as an artist. My oil paintings are usually kept for a specific group of art collectors. Sketching allows me to turn my art into products for the masses. I turn my sketches into books, posters, postcards, collar pins, mugs, etc... you name it. And I would put myself in art fairs to sell them and also use the opportunity to sell myself as an oil painter. What inspires me to draw? I get inspiration from everywhere. It could be a new cafe that just opened in the neighbourhood. Or an old coffeeshop that might be closing down permanently. 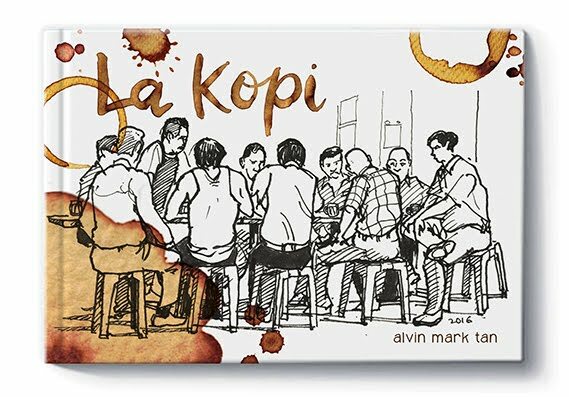 It might be a book that I am working on that gets me sketching a certain theme like my recent book about the coffee scene in Singapore called La Kopi. Seeing beautiful work by other artists who share them on social media also encourages me to post mine online. It’s always a joy to be able to connect with another artist via social media. Not a day goes by without me not sketching. If I take a 3-day break from drawing, I do see a difference when I get back to it – a drop in quality. It's subtle, but this reminds me how pen mileage makes the difference. Besides the drawing and painting commissions I get, my next sketching journey takes me to Art in the Open in Wexford, Ireland where I will run a sketching workshop on July 30, following by a series of sketching trips to Bhutan. I am blessed to have all these opportunities as an artist. Looking back, I am ever so grateful to have taken that leap of faith during that Fall of 2011. ﻿Alvin Mark Tan is a traditional oil painter residing in Singapore. He also illustrates in ink and watercolour. A graphic design graduate from Woodbury University in Burbank, California, Alvin began his graphic design career with the Ministry of Defence in Singapore. Later, at the Singapore Press Holdings, he branched out into advertising, environmental design and documentary-making. He also has an Animation diploma, with a focus in concept art. After walking the Camino de Santiago in 2012, Alvin made a bold decision to sell and leave everything to study what he was always called to do - traditional oil painting. He graduated from Angel Academy of Art in Florence, Italy, where he studied Natural Realism under Maestro Michael John Angel for three years. Apart from doing commissioned art works ranging from still lifes to portraits to ink sketches to wall murals, Alvin loves drawing directly from nature. 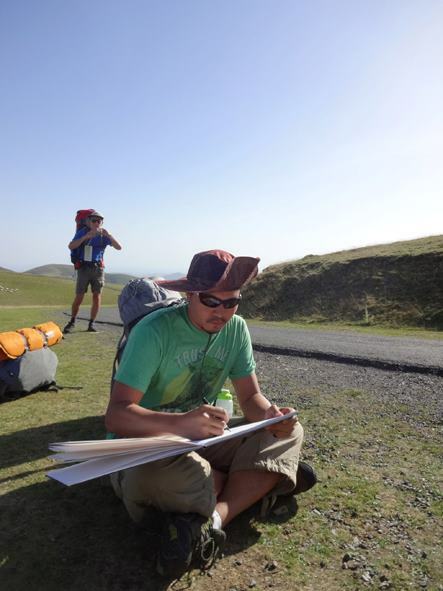 So he is often outdoors doing plein air paintings, on the streets urban-sketching, or commute sketching in his travels. His goal by being a full-time artist, is to encourage people to live out their vocations in life. I was given the opportunity to make a cyanotype print at Deck. The closest thing I ever did to this was exposing a small amount of light in a darkroom to photographic prints with some objects on it and this was during my time as a photo lab assistant in the photography darkroom at college. It's a photographic printing process that produces a cyan-blue print, same as those old school blueprints one would find in architectural offices. In fact, technical drafters and engineers used the process well into the 20th century as a simple and low-cost process to produce copies of drawings. The cyanotype process was first introduced in 1842 by English scientist Sir John Herschel. He was an astronomer trying to find a way of copying his notes. ammonium iron(III) citrate and potassium ferricyanide. overcast day, maybe 30 mins might do the trick.